The Ladyjacks surrounded freshman Shelby Seaver after hurting her knee against Oakland. 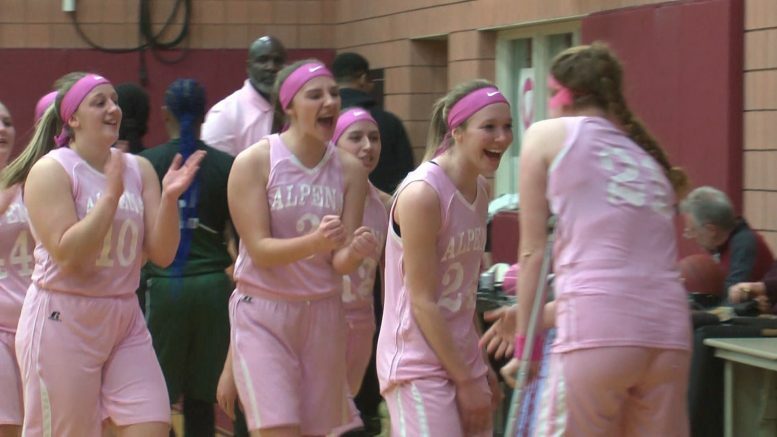 Alpena, Mich. — The Alpena Community College Ladyjacks and Lumberjacks took the court for a special game, Hoops for Hope, supporting breast cancer awareness. The ACC Student Nurses Association sold baked items, made pink ribbons and held a free throw competition at both halftimes, all the money being donated to the Cancer Center for patient treatment and technology. The women earned the prime time spot, playing second in this match-up against the Oakland CC Raiders. ACC took an early 15-0 first quarter lead off two Brooke Nguyen three-pointers. Taylor Livingston knocked down a triple in the second, but it was Emma Jore causing havoc on defense, grabbing the rebound and scoring a halftime buzzer beater layup for the 26-20 lead. Third quarter, the forwards led the Alpena squad in buckets. Ladyjack’s Dakota Prevo contributed four points on field goals and made five of six free throws and Shelby Seaver put up six points and added a free throw. The worst happened with 1:27 left in the third. ACC held a 43-33 lead when Seaver put up a shot in the paint, grabbed her own rebound and then fell down in pain to the court reaching for her left knee. Ladyjacks did not lose their lead in the fourth. Kyra Feighner’s back-to-back threes made the momentum swing back in ACC’s favor, and the Ladyjacks defeated the Raiders 65-51, earning their third win of the season. After the game Seaver got her knee checked out and they said there is not structural damage, no MCL, ACL or meniscus tear which is great news. There could be a bruised bone, which takes time to heal, so Seaver is going to see the orthopedic on Thursday. As for the men ACC started out well, but it was tough trying to contain Raiders’ guard Kevin Fletcher. The six-foot-three Fletcher even threw down a few dunks helping Oakland defeat ACC 90-51. Fletcher led the court with 25 points followed by Raider’s Trenton Jantzi with 21. Up next, Alpena Community College travels to Mott CC this Saturday. The women tipoff at 1 p.m. and the men follow at 3 p.m.